Needless to say, Im against Capital Punishment. The deliberate killing of a healthy human being by the State is simply, IMHO (in my honest opinion) legal murder. If it made the citizenry safer that would be a reason to question it necessary or not but it DOES NOT and may even have an opposite affect by displaying outright, its OK to murder kiddies but only in this case. 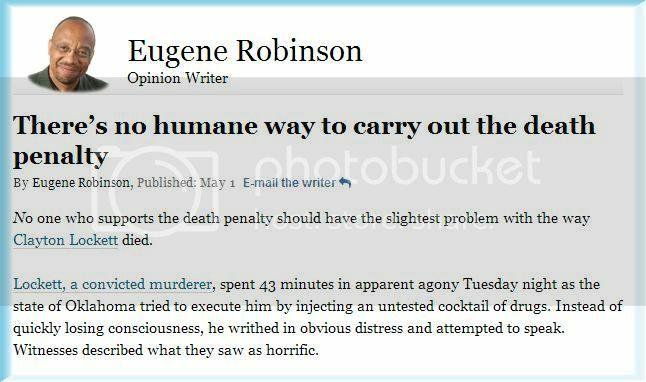 There are many reasons to find lawful extermination of humans appalling but the main reason (for me anyway) is, what if the condemned was innocent, you just cant undo that type of punitive action, now can you (unless you happen to be a man named Jesus). 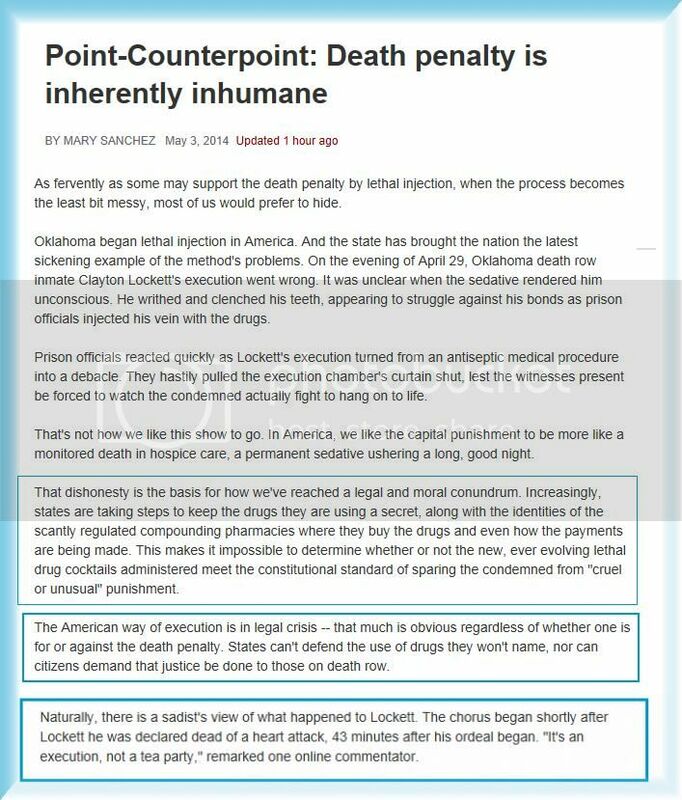 Ive even heard that many states (if not all who think Capital Punishment is A-OK) will not allow anyone to research whether an already executed person was falsely accused and was innocent of the crime he/she had been found guilty by a jury of their (fallible) peers. I include fallible because, good grief, look around at the many Low Information types who live amongst us who, with a drop of a hat, will believe all kinds of nutty and RIDICULOUS conspiracy theories. Furthermore, lets sprinkle a little religion here, since those who rejoice the Death Penalty will quote biblical passages to convince them and us, that we must kill those we judge evil because the bible tells us so.